Yazdanpanah, F.; Jimenez, D.; Alvarez, C.; Etsion, Y.; Badia, R.M. In this paper, we analyze the operational flow of two hardware implementations of the Task Superscalar architecture. The Task Superscalar is an experimental task based dataflow scheduler that dynamically detects inter-task data dependencies, identifies task-level parallelism, and executes tasks in the out-of-order manner. In this paper, we present a base implementation of the Task Superscalar architecture, as well as a new design with improved performance. We study the behavior of processing some dependent and non-dependent tasks with both base and improved hardware designs and present the simulation results compared with the results of the runtime implementation. Yazdanpanah, F. [et al.]. 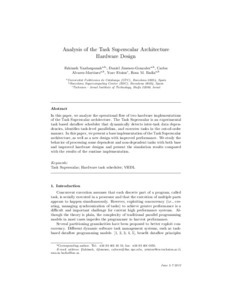 Analysis of the Task Superscalar architecture hardware design. A: International Conference on Computational Science. "2013 International Conference on Computational Science (Procedia Computer Science, 2013, v.18, p. 339-348)". Barcelona: Springer, 2013, p. 339-348.